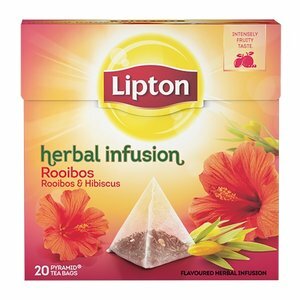 Lipton Rooibos Tea is a herbal tea from South Africa, made from the needles and branches of the rooibos Bush. The taste is enriched with a little vanilla and caramel. Content: 20 tea bags in pyramid shape. Lipton Rooibos Tea is a herbal tea from South Africa, made from the needles and branches of the rooibos Bush. The taste is enriched with a little vanilla and caramel.